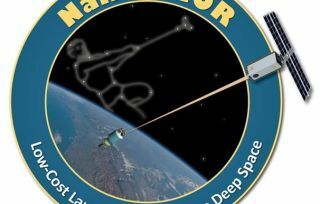 The NanoTHOR project aims for rocket stages to use tethers to toss tiny satellites into space. Humans can only dream of having the power of Thor, the Norse-inspired superhero who can whirl and throw his hammer at blinding speeds. A NASA-funded plan envisions rockets using a similar idea to hurl tiny satellites toward other planets. The "NanoTHOR" project aims to connect small satellites with upper rocket stages by using miles-long tethers, so that the rocket stages can spin the satellites around like Thor's hammer. NASA awarded the idea $100,000 from its Innovative Advanced Concepts program to begin running computer simulations and figure out a hardware design. "Using a few tricks, we could get that system spinning so the rocket upper stage could swing the nanosatellite out of Earth's orbit and on to the moon or an interplanetary trajectory," said Robert Hoyt, CEO and chief scientist of Tethers Unlimited Inc.
Illustrations showing how the NanoTHOR concept would spin satellites around to throw them toward other planets. The class of nanosatellites called CubeSats — tiny satellites the size of a loaf of bread — offer the possibility of replacing more expensive, traditional-size satellites. NASA, the U.S. military and commercial companies have all shown interest in launching several CubeSats at a time by having them piggyback on rocket launches for bigger spacecraft to reach Earth orbit. Tethers Unlimited hopes to make CubeSats even more capable by turning them into interplanetary explorers. Such tiny satellites don't carry their own fuel and rocket motors to escape from Earth's orbit, but the tether plan would bypass the problem by using leftover propellant and momentum from upper rocket stages. "In terms of our hardware it's really just the high-strength tether on a spool," Hoyt told InnovationNewsDaily. "What we need beyond that is to figure out how we can work with the rocket provider so that they can control their upper stage to help us get the system spun up and toss the payload." Hoyt and his colleagues have already spent years testing tethers made of high-strength fibers — such as Zylon or Spectra — typically found in bulletproof vests or similar applications. The current challenge is to figure out how to make a tether system that represents a cheaper option than simply attaching a small "kick" rocket motor to the CubeSat. NASA's recent funding won't be enough to build a full tether system just yet, but Tethers Unlimited plans to use computer simulations to test out the idea in virtual space. The NanoTHOR concept represents just one of two big NASA projects for Tethers Unlimited. The company also recently received a $100,000 award from the U.S. space agency to work on designs for using 3D printing in self-building spacecraft.